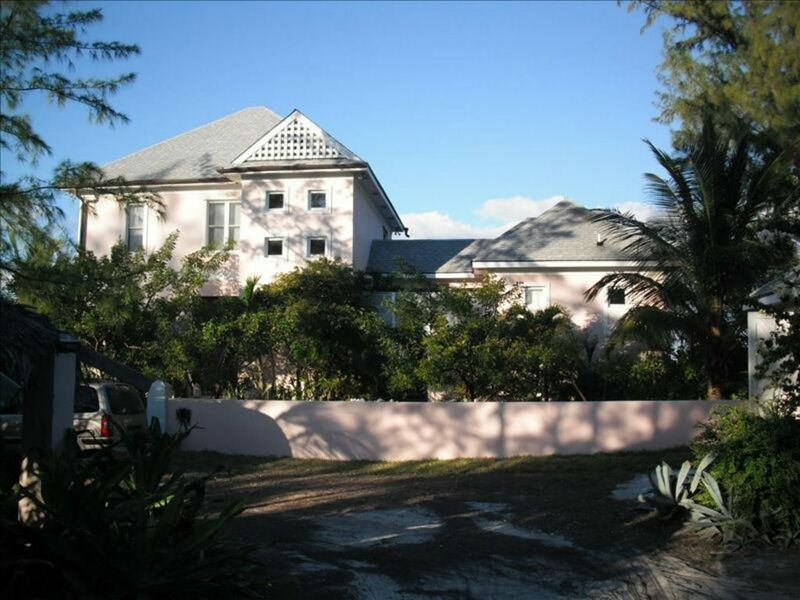 This luxury beach front home is located on Great Harbour Cay's famous 7 mile beach. House features 3+1/2+1/2 bedrooms, 3 1/2 baths, an open kitchen, dining and living area (perfect for entertaining) and large patios and verandas overlooking the turquoise seas and nearby islands. The main house has three bedrooms on the second floor. One bedroom features two queen sized beds and the other bedroom has a queen sized bed, plus a loft with three twin beds. There is a den area offering extra sleeping on two twin beds (this sleeping area has its own access to a bathroom). A palm thatched gazebo is perched high over the powdery white sandy beach- a perfect spot to chill out and catch the refreshing sea breezes. Outside shower. Great Harbour Cay is surprisingly tranquil and non-touristy considering it's close proximity to South Florida. Only 120 miles east of Miami. There are direct flights from Ft. Lauderdale and Miami. There are also 2 flights daily to/from nearby Nassau (only 20 minutes!) Many guests will begin or end their Bahamas vacation in Nassau, checking out the Atlantis or the Dolphin Experience. Great Harbour Cay also boasts many activities, unparalleled in the Bahamas: fabulous fishing- both deep water and bonefishing, shell collecting, snorkeling, diving, golf, tennis, island hopping, and island exploring, just to name a few. There are several restaurants with native cuisine and international fare, small shops, grocery stores, and even a medical clinic on the island. Car, golf cart and jeep and boat rentals are available. Lives in Mobile, Alabama. Have 5 sons and 9 grandchildren. Spend 3-4 months per year in Great Harbour Cay. Rest and relaxation. Check and check. This home was an excellent set up for the laid back time we were hoping for. There was plenty of space for 6 adults and two babies to spread out and enjoy. We were never on top of each other. Infact we had lots of space to spread out and get quiet time. It felt like we were staying in someone's home vs. a rental. It was filled with tons of personal effects and stocked with everything you would need. I was doubly impressed with the great linens and towels. Linens and towels that I dont even have in my home as they would be too hard to keep nice. Thank you for that Michelle! It didn't go unnoticed. All the bedrooms were large and comfortable. The weather was perfect. The island was probably a little too remote for us. But we are not boating people. I imagine to have a boat there and be fishing sportsmen, we would not come to that conclusion. Thank you, Michelle, for sharing your place with us! Thanks I am so glad y’all were comfortable. I hope y’all enjoyed that turquoise water. Thank you Ana. We’re happy you enjoyed your stay and look forward to your return. This place is great! Lovely house, location, kitchen... you name it. One little piece of caution is that the deck is a little old and we got some splinters. Aside from that this house is perfection and the owner is very responsive. The house is beautiful, and thoughtfully designed to make the most of the setting. This amazing home exceeded all expectations. With a warmth that's hard to find, stunning decor and pristine beach (where you'll rarely see another person) we couldn't have been happier! Will absolutely stay here again! Thank you for your hospitality! Our visit to Michelle and Farrell's amazing home provided a great escape from the craziness of our busy world. Tastefully appointed, by obviously loving hands, their home was casual, easy and convenient to the solitude of the beautiful beach. Michelle and Farrell were very helpful in pointing out restaurants, activities and points of interest. GHC is a place with great people, great food (try the homemade breads at Mama Poppel's!) and a wonderful Pina colada! Try the Rocky Hill Pool Bar for a great meal, and the Beach Club for a great breakfast or libation. Charter a boat with Alvin at the marina and explore other islands and enjoy a great lunch at Flo's Conch Shack on Little Harbor Cay. Amazing fishing, dolphins escorting our boat and see the mysteries of Cistern Cay and its shady past! Great place and great people! We look forward to returning soon! * over 2 persons (3-8 people) nightly rate is Variable. Rates listed are minimum and will vary by seasons and holidays. Great Harbour Cay is a secluded island located in The Berry Islands of The Bahamas. There are no banks, ATM's, etc. Most restaurants and stores take cash only, so prepare accordingly. There are 2 flights daily from Nassau International Airport via LeAir (242.322.1317).